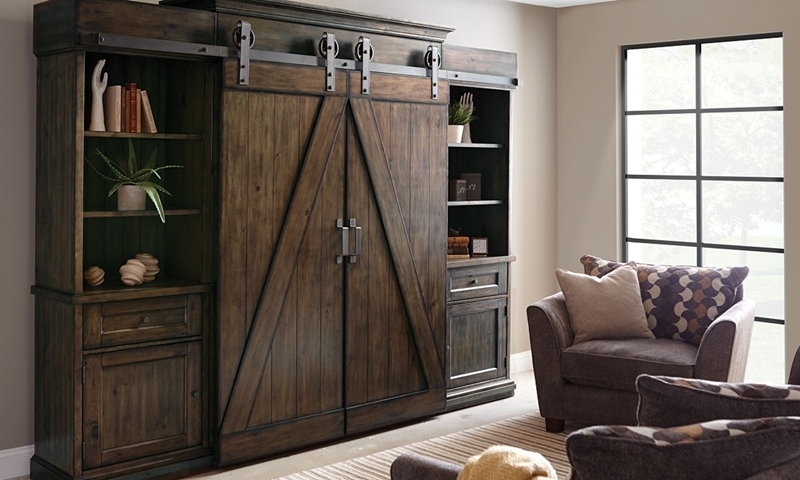 Wall unit delivers storage and display options with rustic charm thanks to its board and batten design with sliding farmhouse doors. The Abington wall unit from Magnussen Home will make the perfect rustic showpiece for your living room. Crafted from hand-finished pine solids and veneers, it features a board and batten design with two large farmhouse doors on a sliding metal rail. An open TV space, two adjustable shelves and two bin-style drawers lie behind the doors, with storage further amplified by the cabinet and felt-lined drawer housed in each pier. Two adjustable shelves with glass insets provide stunning display space on both sides of the unit when illuminated by its built-in LED lighting with a 3-way dimmer.